In 2006 I wrote a series of articles about FON, an initiative to share world wide internet via WiFi for those on the move. Now four years later, the evaluation. For those not wanting to page through back issues of FidoNews or read the prequel articles on www.vlist.org/fon/ here is a short summary. The idea behind FON was that you get one of their home WiFi routers with special software that allows visitors to use your WiFi access point. When you register the access point with FON, you thereby become a Fonero. Visitors can either be paying visitors that buy a day pass, or they can be fellow Foneros who get access for free. In return you get free access at every FON access point in the world. Sounds good doesn't it? I too thought it was a splendid idea, but I was disappointed about how it worked out, as you can read in my previous articles. In my article of September 2006, The Search, I described a fruitless search for FON hotspots and in my October article of that same year - The Bummer - I gave an explanation of why the search was unsuccessful. Now four years later, I can only report that the situation regarding the availability of hotspots has not basically changed. Fon claims the number of hotspots keeps rising, nearly two million now they say, but that does not match my experience and that of others. I still have not used the world wide free roaming as I never found a FON access point when I could use one. Honesty compels me too add that the last two years I have not spend much effort in finding FON hotspots. It is a lot easier to find an open hotspot and even if one has to pay a few Euro to get access at a camping or a hotel, it is not worth the cost of the fuel to go hunt for a free FON spot. On the other side: I have sold a grand total of TWO day passes over the last four years. My share ended up with some €2.50. The low revenue does not bother me, I was never in it for the money anyway. In the meantime FON seems to be steering away from their four year old business model. At first they gave the routers away for a few Euros. They never published how much income they gained from the so called Aliens - people that buy day passes at a FON hotspot - but it became pretty clear that it wasn't enough to get out of the red. So they stopped giving away the routers and started selling them for a price that lets them make a profit on the routers themselves. In the meantime they have issued several new router models with added features. The first so called Fonera had only one ethernet port, the WAN port. The entire LAN had to be wireless. Many Foneros did not like that. Firstly because the FON router was not powerful enough to take care of their needs. Secondly because you want a router to be at a convenient central location in your house, but want the access point to be somewhere where one can get a decent range outside. There is a conflict. And thirdly, many prefer wired LAN over WiFi for their desktops. 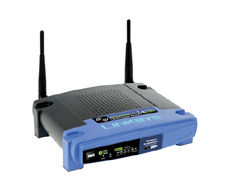 So many do not use the Fonera as their main router, but have it connected to a LAN port on their main router. In that configuration one would like to have the private wireless network to be in bridge mode. So that it is on the same subnet as the wired LAN. But FON has always refused to implement bridge mode. To the chagrain of the FON community. For the first Fonera, the Fonera Classic. there was a club of volunteers who developed alternative firmware. Their firmware did have bridge mode. Plus MAC address cloning. Essential for many users and something FON refused to incorporate as well. After the Fonera Classic, there was the Fonera Plus. It had two ethernet ports, one WAN port and one LAN port. A great improvement, but still no bridge mode and still no MAC address cloning. Next was the Fonera 2.0g. It had a usb port. FON advertised it as a great improvement, one could do all kind of things, like connecting an external storage device and keep downloading with the router only, and the computer off. For me it was a sign that they were moving further away from the concept of generating income by selling WiFi. For the usb port, you want it to be at an easily accessible place, so that you can plug things in. While to function as a wireless access point, you want it to be high up in the attick, or preferably in a whether proof enclosure in the radio tower. Such a whether proof enclosuse, btw was promised by FON as in the pipeline, but it never got beyond the drawing board. The Fonera 2.0g was not a success, FON was unable to make stable firmware and the support for it was dropped within a year. Now there is the Fonera 2.0n. A router with one WAN port, four LAN ports, one usb port and two fixed antennas. It claims to do 802.11N It sells for €79. Shipping excluded. In the meantime there was the "little matter" of FON losing a court case in Germany, where the bottom line was that their business model of selling WiFi was illegal. The latest FON routers have the option of disabling WiFi sharing. The antennas are not removable. I can not connect it to my 7 dBi outdoor antenna. My ISP now has an attractive offer to upgrade to 20 Mbps down, 3 MBps up. I seriously consider taking it. But.. the FON router is not powerful enough to handle that speed. I still think that to share WiFi with others, one should physically separate the router function from the access point function. No support for IPv6. Not from FON anyway. With less than two years to go in the most optimistic predictions for IPv4 to run out, I think that one should not buy new network equipment any more that offers no IPv6 support. I have no use for the advanced functions available through the usb port. My computer that runs the FidoNet sofware is always on, so I can use that as a print server for the network and I can use that for receiving extended downloads if I wanted. I don't, I am not that much of a downloader. It looks like me and FON will be going our separate ways any time soon now. From my POV, the experiment with sharing WiFi and getting world wide free roaming is a complete failure. I do not expect that situation to improve, because FON seems to realise it too and has been moving away from that concept in favour of becoming a pure seller of WiFi routers for the low end market. Routers that - admittedly - sell at a fair price, but they are not what I want in a router. When I need a new router, I prefer to spend a little more and go for a router that gives me what I want in a router, rather than what FON wants me to want. My next router will do WAN speeds in excess of 50 MBps and it will do IPv6. So I have decided the sharing experiment is a failure and I do not like the FON routers enough to buy them for their own sake. The list of things that went wrong between me and FON is long. Four years ago I wondered if they would still be in business by the time I first made use of the free world wide roaming. Well, they are still in business, but it is not the same busines that they started out with four years ago. Four years ago FON presented itself as a movement, a community of volunteers that would cause a revolution by sharing their WiFi. But FON has alienated themselves from their constituency. They didn't listen to them, they mislead them with numbers that did not add up, etc, etc. The straw that broke the camel's back is that some six weeks ago they replaced the FON forum. And they didn't bother to move the user accounts to the new board. I can create a new account, but then nowhere will it be visible to the new users that I have participated almost from the beginning, that I have been a beta team member, etc, etc. It annoys me. Perhaps it is a bit childish to make an issue out of this and some may say I am too easely annoyed. Be that as it may be, I have decided this is the end of a friendship. I have not created an account on the new forum and it seems I am not the only one. I see very few of the pioneers that were active in the old forum. This article will also be published in FidoNews , July, 12th, 2010. Laatst bijgewerkt | last changed April 17, 2011.